These are all accounts that have been active since long before the 2017 crypto bubble. Pretty much every one of these people has already made their fortune trading and it comes through in their tweets. 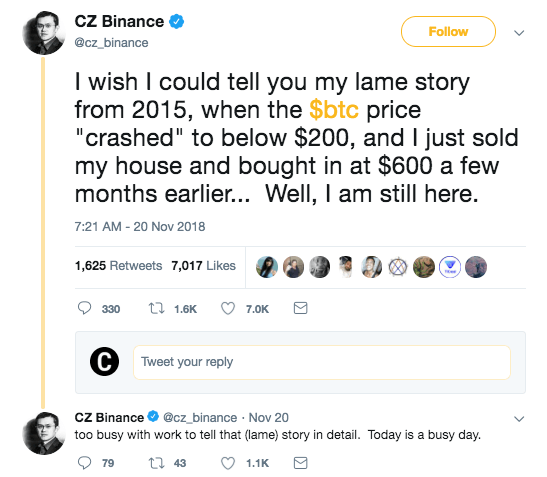 Often accused of being “lucky” despite the fact that they were smart enough to trade from 2014-2015 when everyone else thought crypto was dead. Priceless wisdom to be had by following them, but they won’t make it easy for you to find. All funny, some with darker humor than others. “Crypto trader turned internet joke factory”. 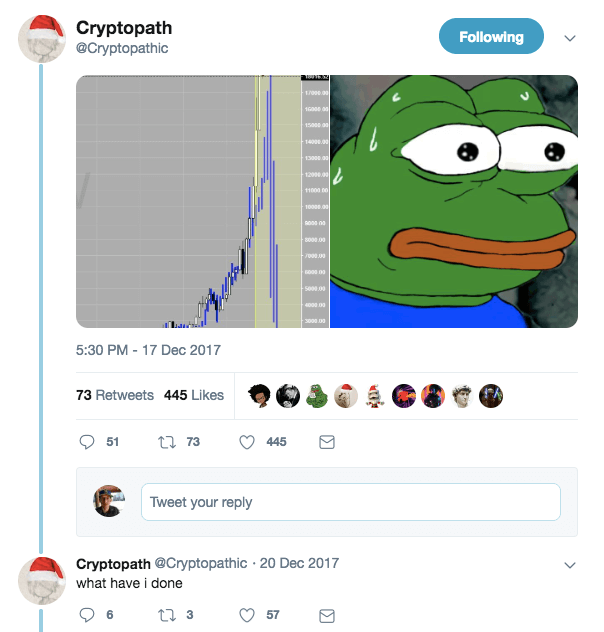 If you’re losing money in the crypto market, you probably don’t want to follow him. Will twist the knife (in the most hilarious way possible). The most outspoken bear of 2018. Recently deleted all his tweets but will likely return the next time Bitcoin drops 10%. 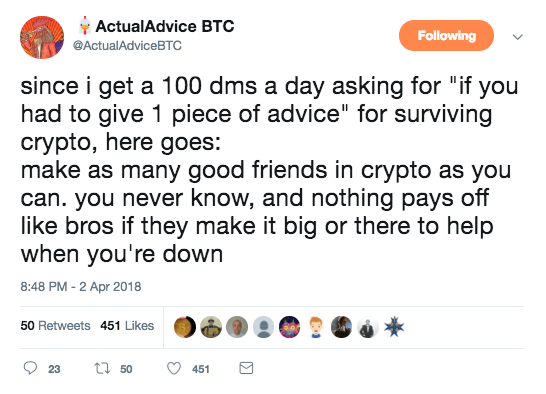 Active trader, great follow for tips on lesser-known coins. Legendary altcoin miner. Will help you stay ahead of the curve on potential new opportunities. Big fan of Dragonchain. One of the most lively traders of the OGs. Highly active and constantly commenting on news. Also a representative for numerous exchanges if you have a customer support issue. The least sarcastic of these OGs. Actually seems genuinely nice at times. Probably shows his face more than anyone else on crypto twitter. Plenty of live video streams and opinions. An entertainer through and through. One of the most well-respected accounts. Comments on the entire community. Called the top of the 2017 bubble perfectly. These people head up some of the most important businesses and organizations in the cryptocurrency space. Generally a bit more “professional” than other crypto twitter accounts. 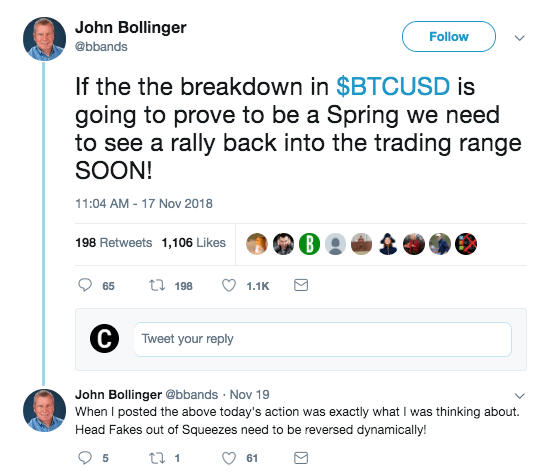 Co-founder and CEO of BitMEX, the world’s playground for leveraged BTC trading. Co-founder of BITMAIN. His company is the leading producer of Bitcoin mining hardware in the world. Likely has control over more hashing power than any other human on earth. Co-founder of Lightning labs which many community members believe is pioneering the best way forward for Bitcoin’s scaling issues. CSO of Blockstream, another company looking to help solve Bitcoin’s scaling issues. Co-founder and CEO of Coinbase, the #1 on-ramp to cryptocurrency for US citizens. Early Bitcoin investor. Influential within a number of companies via his firm DigitalCurrencyGroup. 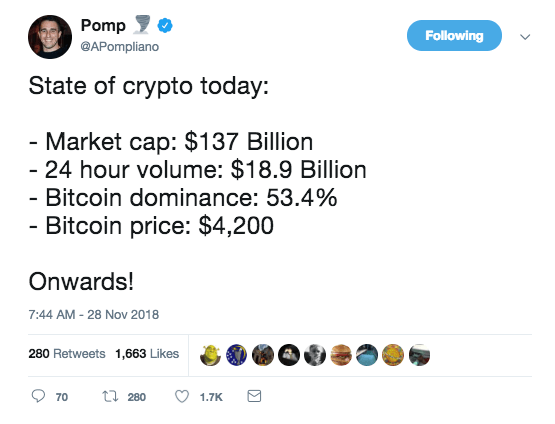 CEO at Binance, the world’s #1 exchange by volume for cryptocurrency trading. Early investor and outspoken Bitcoin supporter. CEO at crypto-to-crypto exchange ShapeShift.io. CEO of Twitter and Square and an outspoken Bitcoin supporter. 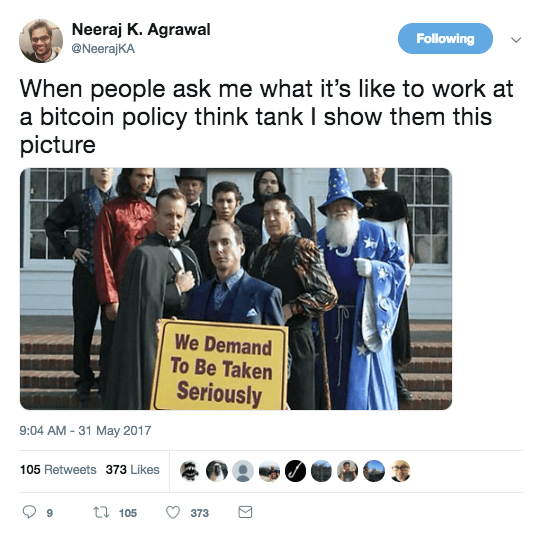 Communications director for Coincenter, the cryptocurrency policy think tank. Quite possibly the most powerful voice for crypto in Washington D.C.
All of the accounts listed here have experience maintaining the actual code that drives some of the world’s most popular cryptocurrencies. Good resources for filtering out the BS that is spouted by much of crypto twitter. Will be the first to call out dumb ideas that aren’t technically feasible. 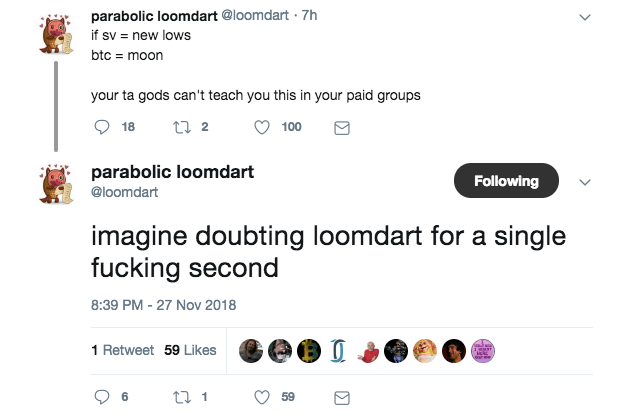 Developer of Viacoin, crypto twitter’s unofficial favorite coin. 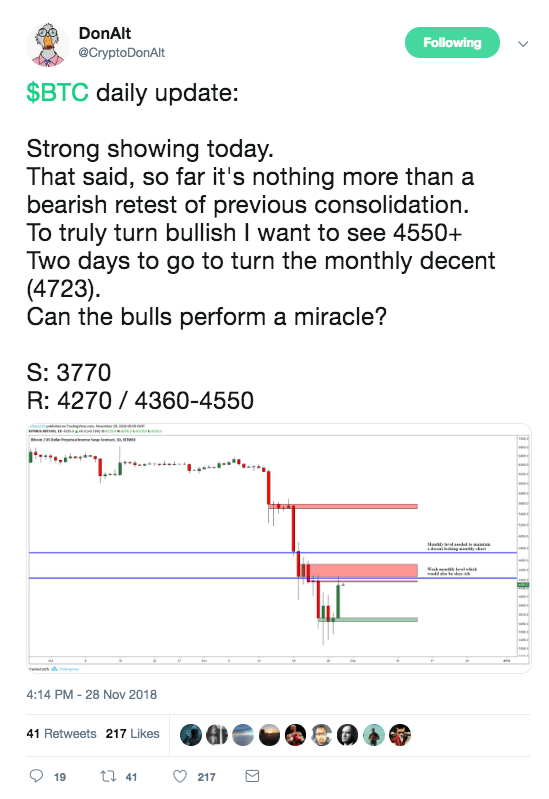 Caused a month-long bull-run by fulfilling a crypto twitter prophecy. Original developer behind Litecoin, one of the earliest and most popular “altcoins” to Bitcoin. Core developer for privacy coin Monero. Streetwear aficionado. Cryptographer who invented the Hashcash protocol. Hashcash was cited in the Bitcoin white-paper by Satoshi Nakamoto as an influence for the proof-of-work algorithm that powers bitcoin. Lead developer of Ethereum. Outgoing. Active Twitter feed full of casual and technical discussion surrounding Ethereum and many other projects in the space. 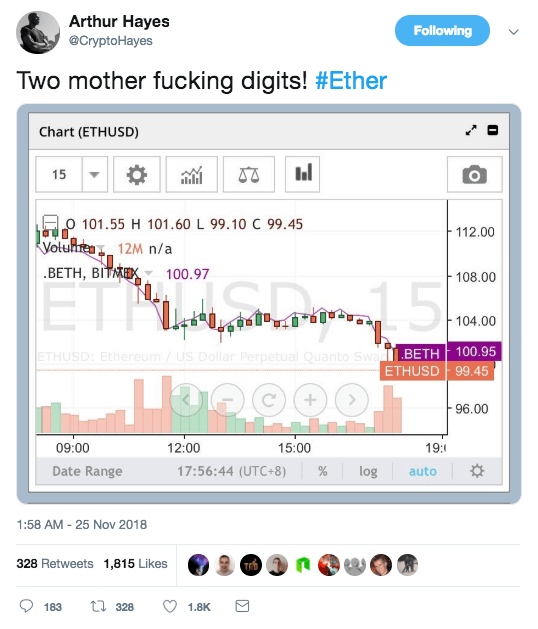 CEO of IOHK and founder of Cardano and Ethereum* (co-founder*). Make sure you know that or he may yell at you. Founder and developer of privacy-focused altcoin Zcash. Early Bitcoin core contributor. #21 all time on GitHub in terms of total commits to Core’s GitHub repo. Strong opinions on crypto and tech in general. 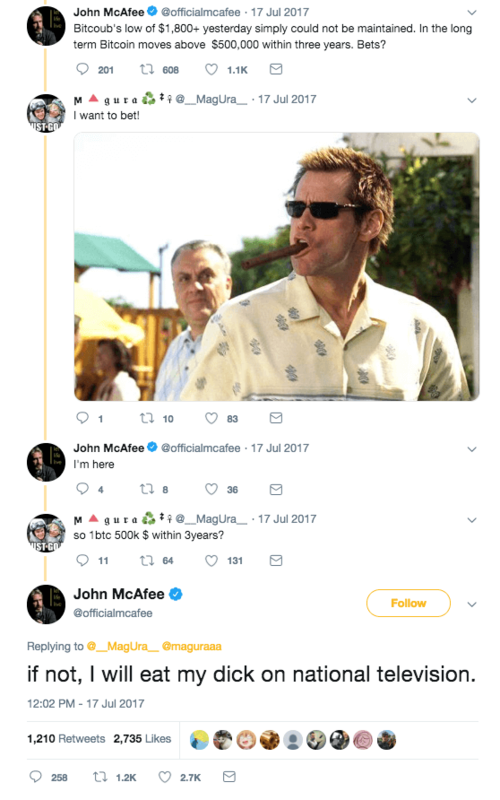 Another long-time Bitcoin Core contributor. #10 all time on GitHub. Critical commentary on Bitcoin and, sporadically, traditional Roman Catholicism. We don’t consider Ripple (XRP) to be a legitimate cryptocurrency, but learning about it is essential to understanding the community. 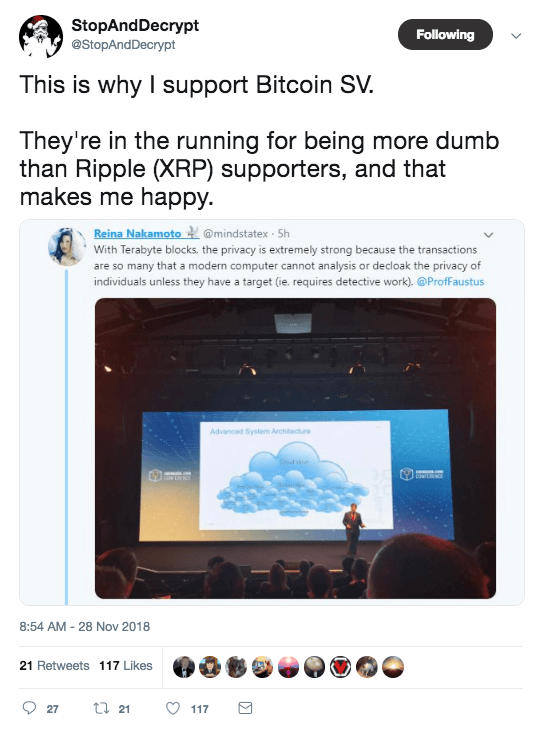 Schwartz is the CTO at Ripple. Crypto twitter’s most hated…Faketoshi. Insane person. 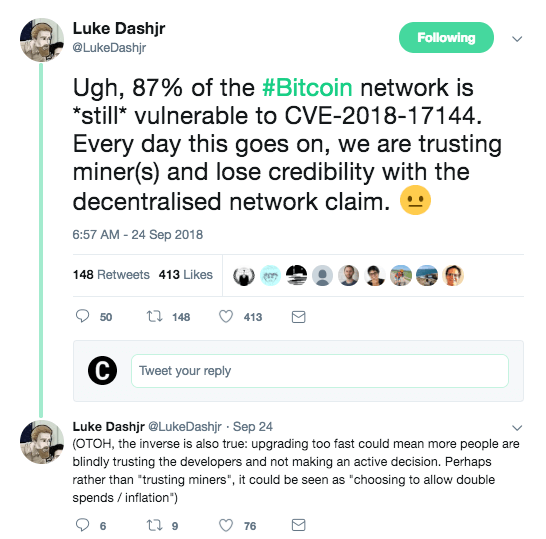 Claims he is Satoshi Nakamoto while offering no credible evidence. Is currently working on one of the failed Bitcoin Cash forks. Follow for unintentional humor and nothing more. Will ban you if you make fun of him. There’s no shortage of crypto-related content in the form of videos, articles, podcasts, and more. A lot of it is trash. These accounts are reliable sources for high-quality content that will actually help you learn. Host of Shitcoin talk, the best show committed purely to trading bitcoin and altcoins. 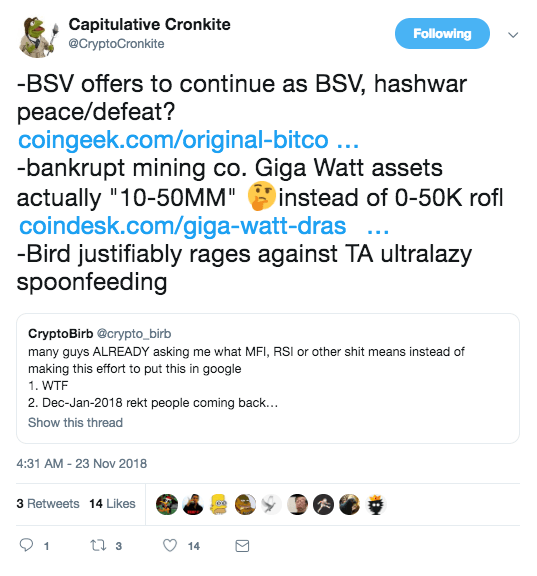 The undisputed source for quality updates on what is happening with Crypto Twitter. Browse the feed when you need to catch up. Co-Host of the CryptoStreetPod which does some of the best interviews in the industry. Busch Light Enthusiast. Reporter for CoinDesk. One of the few journalists you will find that actually puts effort into mastering the space. Technical Editor for Bitcoin Magazine. An absolute must follow if you want to understand the mechanics of Bitcoin and other cryptocurrencies. Quite possibly the industry’s best writer in general. The most prolific producer of content with the purpose of making Bitcoin and other cryptocurrencies accessible to the masses. 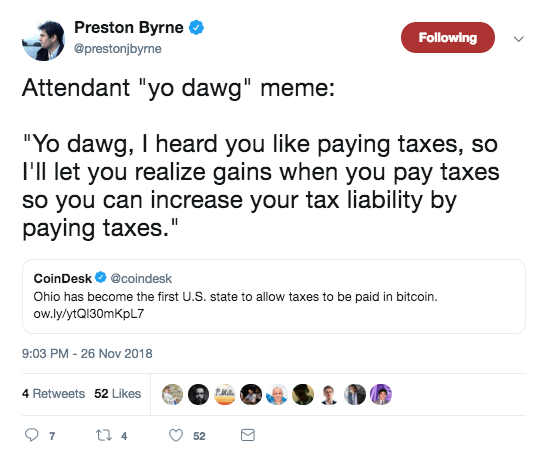 The #1 public expert when it comes to United States cryptocurrency tax law. Super insightful and always open to questions. There is no-one putting out more consistent, detailed, high-level research on cryptocurrencies. 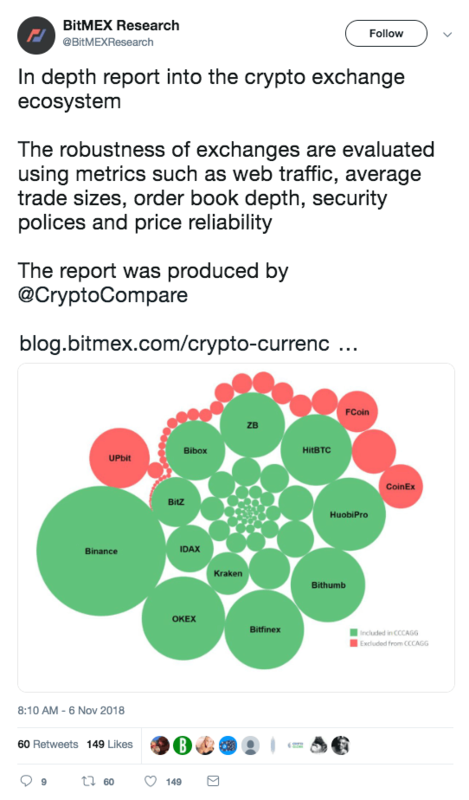 The content arm of the BitMEX exchange. Your best resource for learning about cryptocurrency mining. A lot of people are into cryptocurrencies because they want to get rich. These guys are doing it better than most. Plenty of posts on technical price analysis of different coins and they are usually open to answering questions (if you ask nicely). Remember though, this is not investment advice. Most of these people have cartoon characters for AVIs. Imagine explaining to your wife that you lost the kid’s college fund because you made your investment decisions based on a cartoon Jalapeno from Twitter. Borrow their knowledge, these people are smart. But make your own decisions. Crypto Twitter’s current most popular trader. Exceptional content. Offers a huge amount of free Technical Analysis lessons and articles. Brutally honest. Up-and-coming trader. Star of the Crypto Dog Pound trading community. Analysis of high-cap coins but also a great follow for knowledge and insight into lesser-known coins. Very active and constantly posting charts. Conducts trading live streams on Twitch. Dabbles in general industry commentary but also offers solid technical analysis. Consistent producer of educational content. A lot of shitposting but plenty of insightful charts as well. One of the rare high-profile traders that doesn’t try to maintain some form of anonymity. Prolific charter. Extremely disciplined and focused trader. Feed can sometimes seem a little boring since he is so focused on price action. 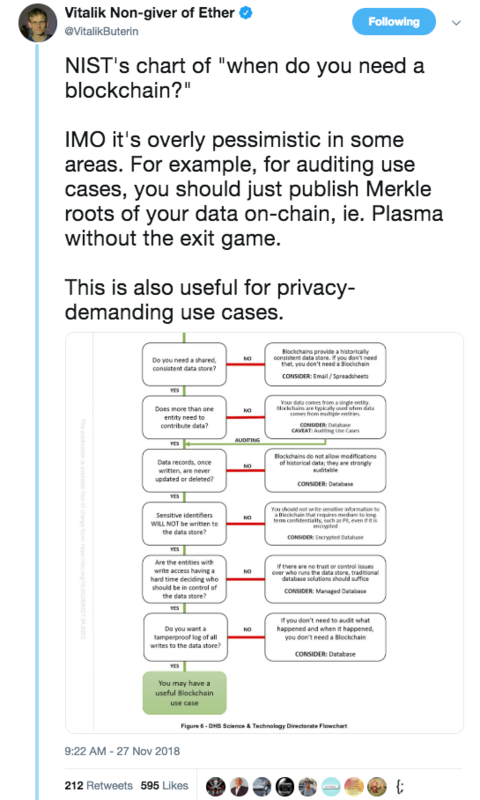 Note: There are a lot of crypto trader accounts on Twitter that will try to get you to pay for access to their “exclusive private trading group”. 95% of these accounts are frauds trying to take advantage of gullible newbies. 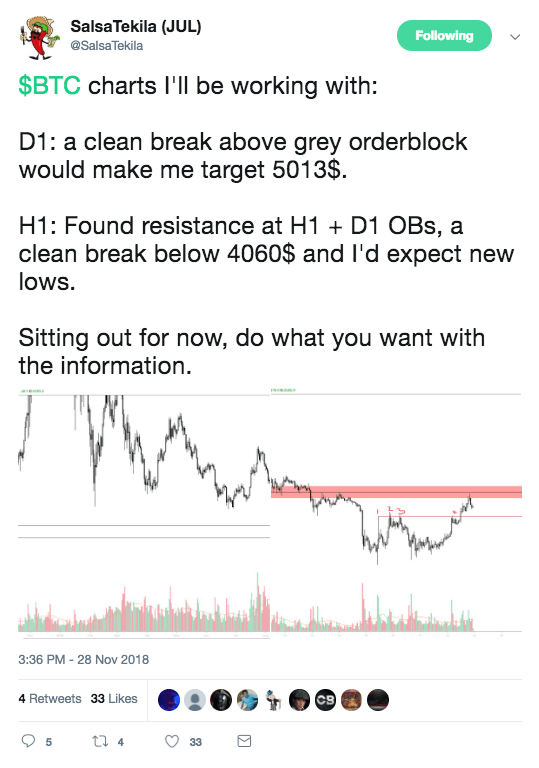 All of the useful technical analysis you need to succeed in the cryptocurrency space is available for free if you are willing to hunt for it. Don’t get scammed. Chairman of the United States Commodity Futures Trading Commission. 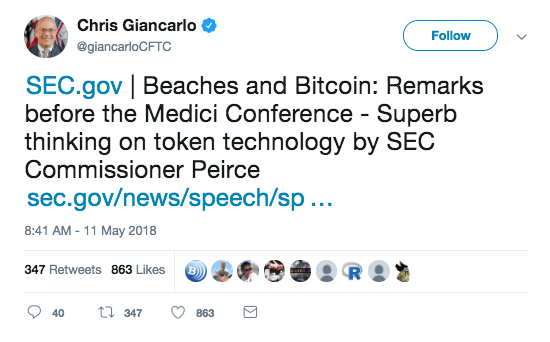 The highest ranking U.S. Government official to openly support cryptocurrencies. The Buc Nasty of hating Bitcoin. 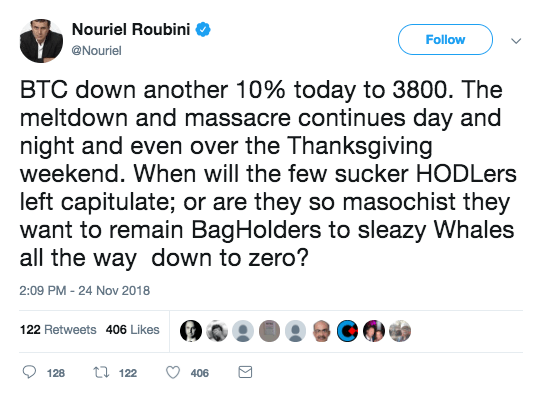 The go-to economist for New York Times op-eds that hate on cryptocurrency. Gold bug that hates anyone who entertains the thought that Bitcoin could be a considered a gold alternative. Another gold bug that tweets about Bitcoin more than his favorite commodity. Unapologetic Bitcoin maximalist. Strong political opinions. Will probably get banned from Twitter at some point. 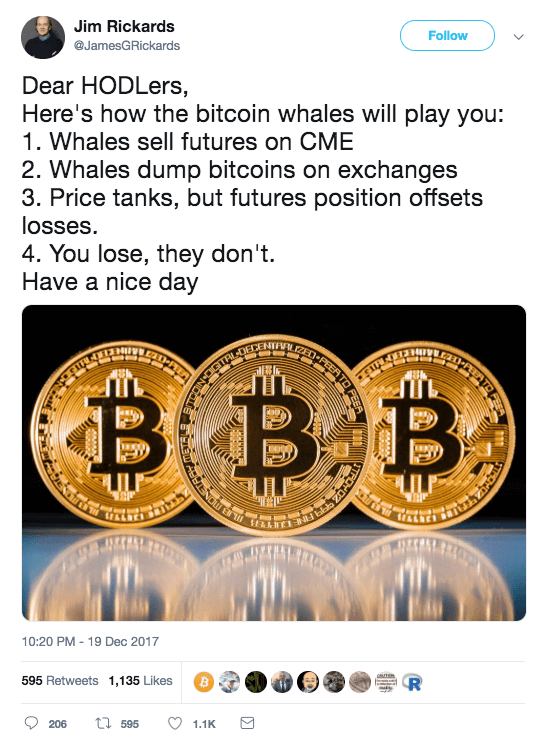 Your source for pure, unadulterated, crypto market hopium. 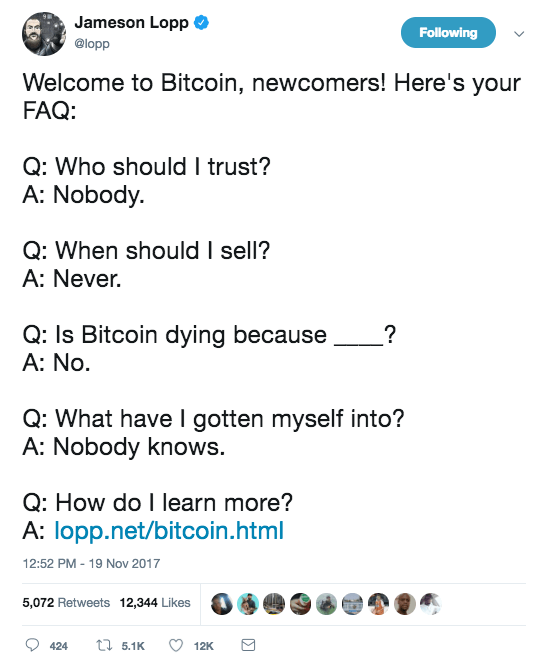 Most likely an AI programmed to tell blockchain believers everything they want to hear about their favorite technology. “Your Bitcoin #HODL spirit guide for the journey to $100,000 and beyond”. 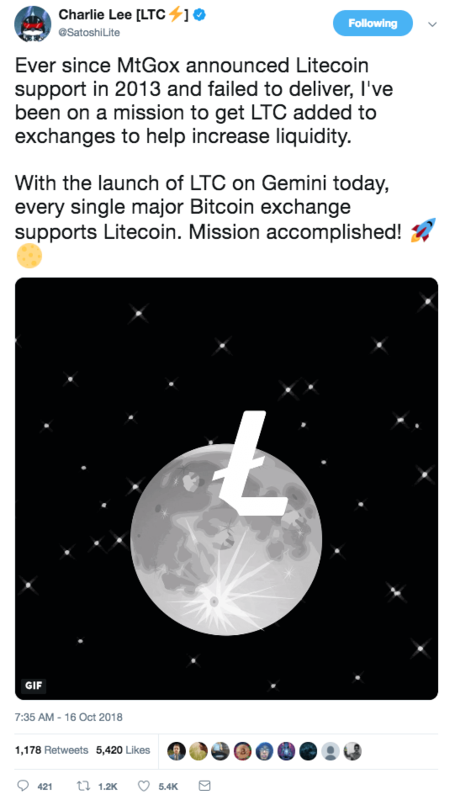 The most over-the-top optimistic crypto twitter account. A living example of the cypherpunk ideals at the roots of Bitcoin. 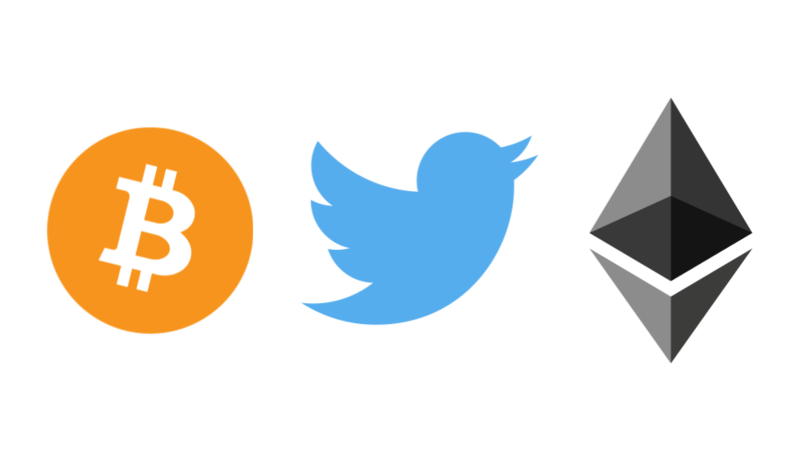 These accounts don’t fall into any neat category, but all deserve a follow if you want to diversify your crypto twitter feed. Good mix of experienced users and newer accounts with high-quality, informative content. Plenty of controversial food takes and offensive political commentary as well. Tweets in his own language. Funny af. Possibly Satoshi. Stardust sock puppet account. An intellectual giant. 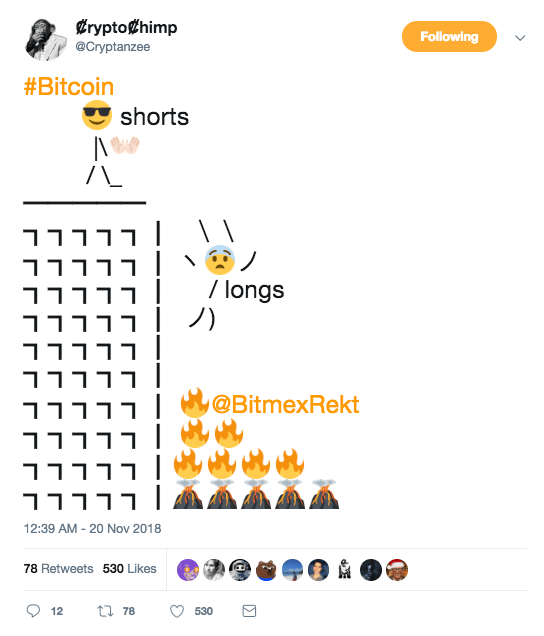 The best original crypto memes on Twitter. “Blurring the lines between shitposting and genuine stupidity”. 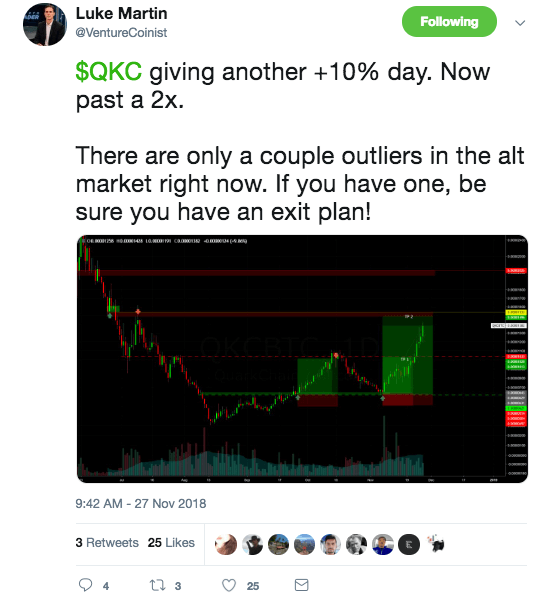 Plenty of joke posts but a lot of honest conversation regarding promising altcoin trades and the overall market. Trader who made his money and is living the dream in Thailand. Crypto Twitter ambassador to Dog Twitter. Doesn’t tweet a lot but always insightful. Technical insights mixed with ruthless Bitcoin maximalism. 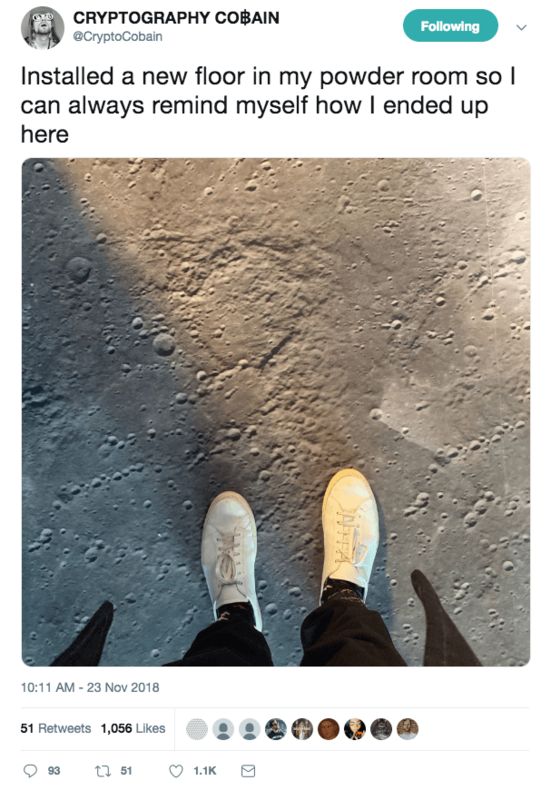 Elon Moist. Your personal Crypto Twitter trip sitter. Insightful charts mixed with bitter sarcasm. At one point, apparently, was a crypto trader. Now mainly tweets about deadlifting. Still hilarious. “Art and science. Bitcoin”. He’s brilliant. The only crypto account followed by Ethan Klein. Psychedelic Spaceman hunter of crypto gems. “ancienTbeingno legal adv”. 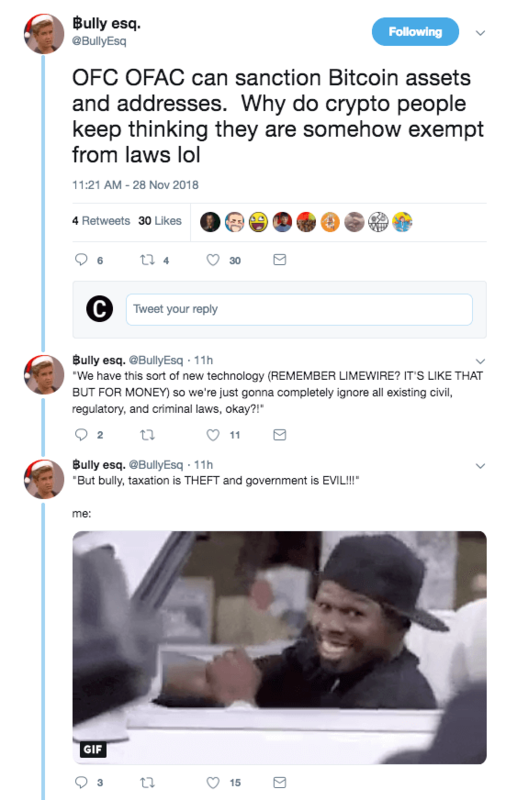 Crypto Twitter’s resident lawyer. Bad food takes. Crypto miner and trader with an eye for new and undervalued coins. Doesn’t tweet often, but worth paying attention when he/her/it does. It’s always good to make sure you’re balancing out your Twitter feed. 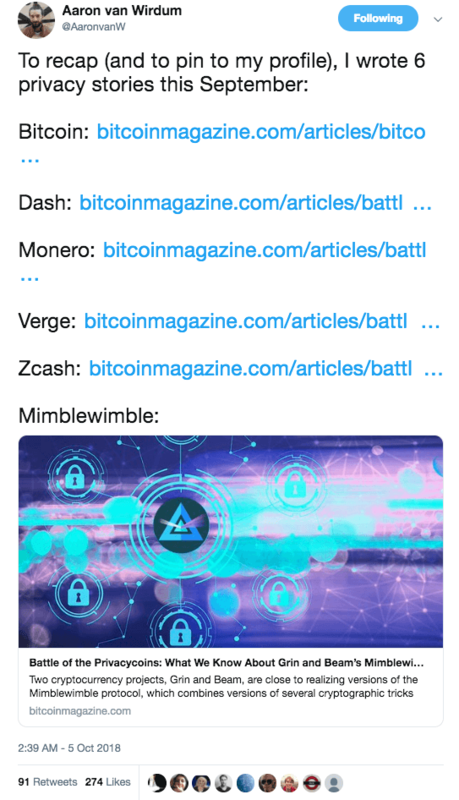 These accounts aren’t 100% committed to posting about cryptocurrencies, but they do dabble. They’ll help you gain the perspective of a knowledgeable outsider. Legendary technical analyst and trader. Has an indicator named after him (Bollinger Bands). Super accessible and willing to discuss ideas with followers. Another veteran trader of traditional markets whose attention has been captured by cryptocurrencies. Libertarian attorney. Self-described “blockchain nerd” but also one of the most reliably thorough skeptics of the entire space. Still rooted in crypto (he’s a “smart contracts pioneer”, but his commentary spans a wealth of other topics including political science, economics, and history. The original developer behind Dogecoin. Has definitely tried to distance himself from the space, but he still keeps a close eye on it. Another excellent voice for skepticism. Venture capitalist who famously purchased 30,000 BTC via the US government’s first-ever auction of bitcoins. The bitcoins were seized from the illicit dark-web marketplace The Silk Road. It he tries to offer you a cryptocurrency giveaway just say no. The best indicator that you should sell some crypto. 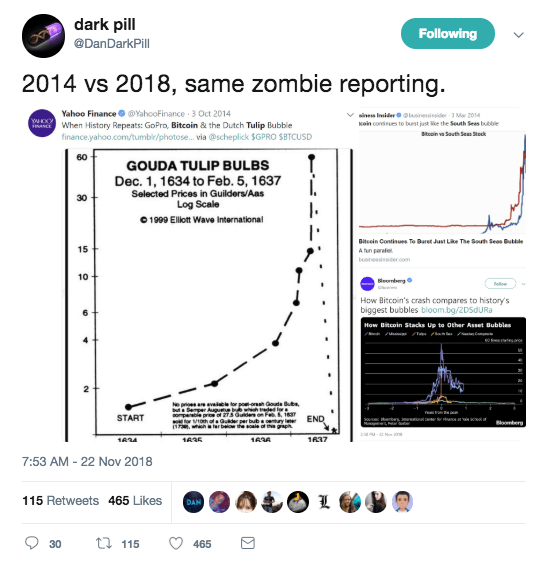 Started putting out Bitcoin content near the top of the 2017 bubble. Ended in early 2018. When he starts talking about Bitcoin again, a new top is likely near. You won’t get much in the way of commentary from these accounts, but they’re an essential follow due to the effect that their announcements can have on the market.